Home » Channel Islands » Scandal & Heresy in the Priory of Notre Dame de Lihou ? Archaeological excavations of the Priory on Lihou island have unearthed, quite literally, some intriguing details about who lived there and has raised some serious question about what they might have been up too ! We certainly know that the Lihou priory had a very chequered history. 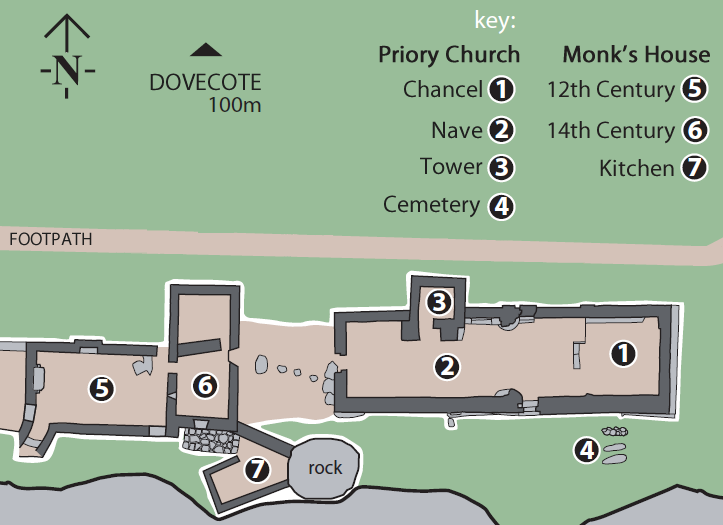 In 1304 Thomas Le Rover, a servant of the prior, killed one of the Lihou monks, Brother John de l’Espin, in the priory. 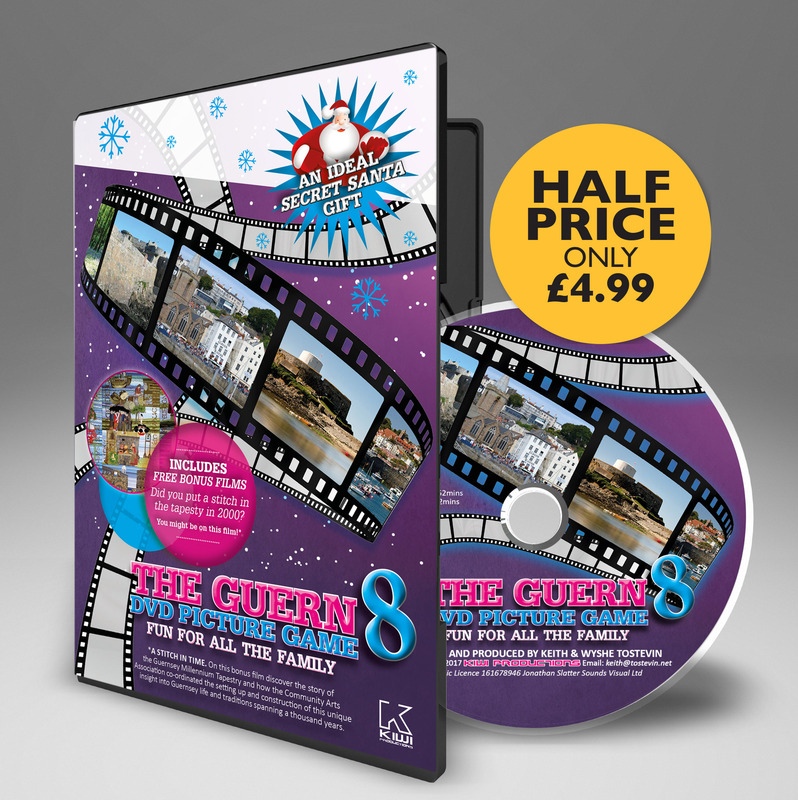 In the fight to arrest him that followed the killer was himself killed by former bailiff named Ranulph de Gautier. De Gautier then fled to claim sanctuary. What followed involved torture and the death of 2 more people (you can read about it here). 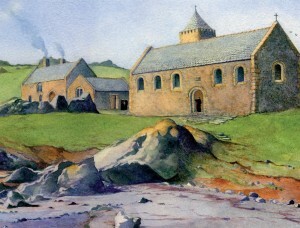 The Priory on Lihou was founded in the 12th century and was run by the Benedictine order. It was a dative priory, which means that it was a place where dues were collected for the mother house, in this case Mont Saint Michel in Normandy. In 1999 the programme, Meet the Ancestors, assisted in excavations led by the States at the priory. What they found was unexpected and startling. Fifteen human skeletons were discovered buried there. Five of these, including a child, were interred beneath the nave. Of the remainder, three lay outside the walls (indicative of suicides) and two were buried in stone-lined cists. Three skeletons were excavated and all three had brooches in their pelvic area. The brooches had been placed there for a symbolic reason and such grave goods are not usually associated with Christian burials. This was not all. A small, carved face on a piece of Caen stone, measuring some five inches by two (13cm x 5cm), was also discovered. It was pre-12th century and therefore pre-dated the excavated graves. The little face was said to be ‘very human’ in appearance with something feminine about it and the facial features bore some resemblance to La Gran’mere at St Martin’s. Again more evidence of possible pagansim. 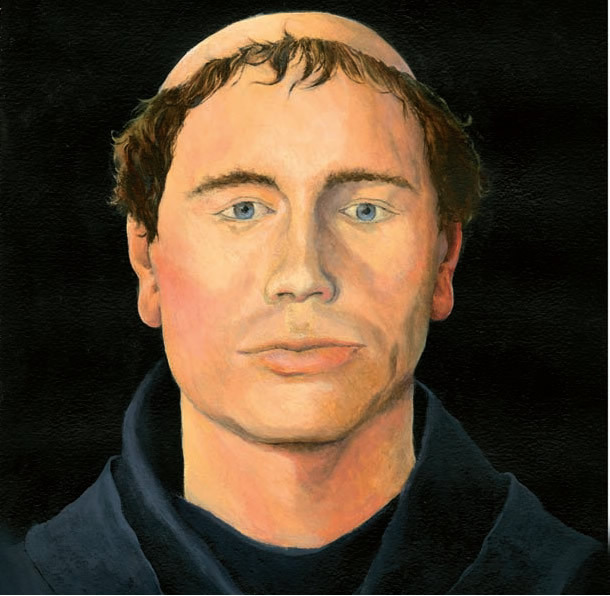 In February 2000 one of the skeletons, nicknamed Mr Lihou, or the Monk of Lihou, was facially reconstructed. The Monk of Lihou was a tall man (6ft 2in or 1.9m) aged between 25 and 40, a good-looking Englishman who had died around 1250. He was suffering from syphilis. Small children and sufferers from sexual diseases are not the normal incumbents of dedicated monastic graveyards! There is also an epic poem about an incident which took place in October 1595 when a local rector found himself cut off on Lihou with half-a-dozen island girls. The writer of the poem named him the Prior of Lihou and the girls he called the nuns of Lihou. Unlikely as it sounds, the rector was persuaded to bed all of them. However, worse still were the tales of the monks cavorting with local girls and, according to some, even witches. Certainly the general conduct of the priory inmates on Lihou seems to be have not been always exemplary and in 1484 the prior was charged with heresy by the Abbot of Mont-St-Michel. The small, carved feminine like face on a piece of Caen stone would seem to suggest the possible existence of a mother goddess cult on the island. The Celts, from nearby Brittany and across the Channel in England, worshipped a mother goddess and had a tradition of carving freestanding human heads and faces. This survived into the 20th century in the English counties of Derbyshire and West Yorkshire. The intriguing question is, what was the likeness of a pagan goddess doing in the middle of a Christian priory on this tiny and remote Channel Island? in 1484 the prior was charged with heresy by the Abbot of Mont-St-Michel. Paganism and witchcraft are said to have long been associated with Lihou and devil worship is supposed to have taken place at Le Catioroc, not far from the island. 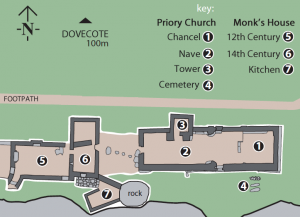 Someone once raised the question of why a reasonably-sized priory should have been built on such a small island, rather than a hermitage cell for a single monk. Undoubtedly the answer lay in the fact that the Church was making a statement aimed at those who had worshipped at Lihou’s former pagan shrine and at those who mocked Lihou from across the water. Despite the stories, the scandals, the murders and the mysteries, Lihou did become a renowned place of Christian pilgrimage. The priory itself did not survive the dissolution of the monasteries in 1536 by Henry VIII, but its reputation survived the destructions of those times.